After windows, roofing, and insulation updates we like to recommend that homeowners update their kitchens and bathrooms. We’ve put together some of our favorite examples and helpful tips for remodeling your manufactured home bathroom. 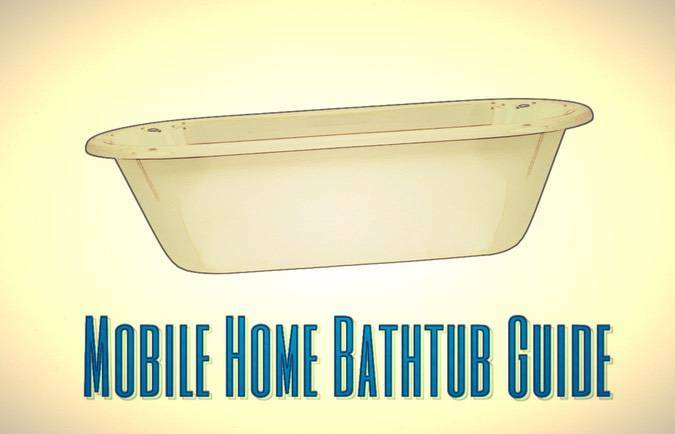 We’ve published a complete mobile home bathtub guide here. Learn the different types of mobile home tubs, sinks, and faucets. If you are going to remodel a mobile home bathroom you’ll want to read this post. Water is the most destructive force on earth. You don’t want a $300 bathtub to do $3,000 in damages because the drain wasn’t properly installed. If you can do the demolition yourself you can save a good deal of money. Use those savings to hire a licensed plumber to do your tub faucet and drain connections (you can probably handle the sink yourself). A great way to save money on a bathroom remodel is to keep your layout the same so no plumbing pipes need to be modified. Changing the placement of the pipes is often the biggest expense when remodeling a bathroom. If you are remodeling your manufactured home bathroom yourself you will want to start with a detailed plan. Measure the room and everything in it first. If you want to get real fancy you can use a site like Room Sketcher to create a floor plan on paper. You will need to make a few decisions based on the measurements such as the tub replacement. 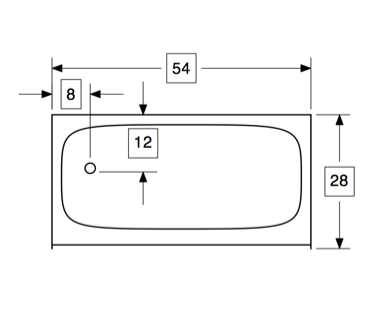 To measure your tub size you just need to measure the rough opening or the opening that the entire tub fits into. That’s it. The average bathtub size in a site built home is 60″ long and 30 or 32″ wide. The average bathtub size for manufactured housing is usually 54″ long and 27″ wide. If your bathtub is mobile home sized you will need to decide whether you will order an exact fit tub from a mobile home parts store at a fairly high price or if you will retrofit a much cheaper standard size tub from your local home improvement store. Read this detailed mobile home bathtub guide here. Mobile home sized bathtub and surround. Mobile Home Sized Tub or a Standard Size tub from Lowe’s? Mobile home sized tubs can be expensive and if you have to pay for shipping it will make it even more expensive. Last I looked, a tub and surround set can run about $622 online at Mobile Home Parts Store (affiliate link). 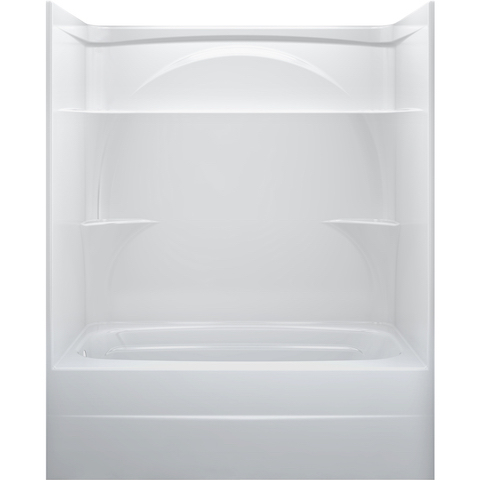 60″ x 32″ bathtub and surround at Lowe’s for $399. The cheapest tub and surround at Lowe’s will run about $400. However, you need to factor in the costs of moving walls for this new tub size. You can save money by going with a cheaper surround option. There are so many choices: tile, plastic, and VOG panels have all been used as bathtub surrounds. There are a lot of variables in this decision. First, you have to have space. It will be a lot easier to retrofit a larger tub if your water heater sits directly behind your tub’s faucet wall (a very popular layout in the 1970’s). Pushing a wall over a few inches is a lot more work than most people realize. 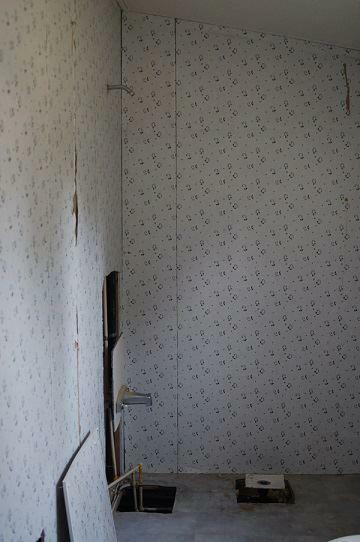 You will need to figure out how you will deal with ceiling and the flooring. Scars from the wall will be obvious and those ceiling panels are a pain to repair. This decision is also a cost versus convenience thing. Paying $622 for the mobile home size tub, plus all the extra supplies needed, will certainly be more convenient and probably the best decision for those that aren’t experienced in complex DIY projects. You could easily have the old tub out and the new tub installed in a day. Left Hand or Right Hand Tub? After deciding whether you go with a mobile home tub or a Lowe’s tub you will need to buy the tub. This isn’t as easy as it seems. If you are not changing the placement of your plumbing lines you need to buy a tub or shower unit that works for your home using terms like left hand, right hand, or center drain. Look at your tub as if you are about to step into it. Where’s your drain? A ‘left-hand bathtub’ has the drain on the left. A right-hand tub has the drain on the right. Center drains are, obviously, in the center closest to the back wall. A quick word about bathtub supports: you will need to speak to a qualified bathtub salesperson so they can help you choose the best support system and installation for your bathtub. Notice the foam tub base on the bottom. A plastic surround for a mobile home sized tubs runs around $210 without shipping. It’s about the same with Lowe’s surrounds. Here’s a mobile home supply site with a little more info about surrounds. Here’s the part where I preach about having a professional install your tub/shower and tile the surround. If you have experience fine, but remodeling your manufactured home bathroom isn’t the place to start doing-it-yourself. A new manufactured home with a corner shower unit. Fancy, fancy! You can always bypass the whole bathtub situation and install a shower unit in place of your mobile home tub. You will need to decide on the mobile home versus Lowe’s here, too, but it’s not quite as difficult with showers though. As with your bathtubs, you will need to have the exact measurements of your drain and supply line if you are going to choose a single shower unit. The two most common mobile home shower pan sizes are full shower and shower stall. A full shower pan is the same size as your mobile home bathtub, 54″ x 27.” The shower stall sized pan is 32″ x 32″. 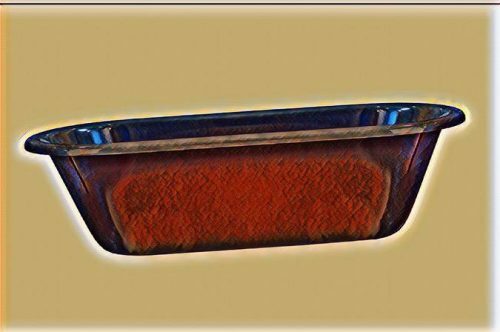 Click here to read a little more about shower pans. Check out these great tips on remodeling your manufactured home bathroom that Kimberly shared with us! 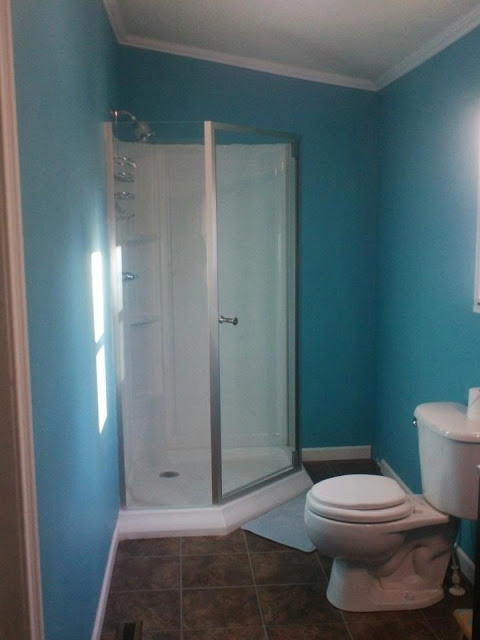 Kimberly did a complete manufactured home bathroom remodeling project. 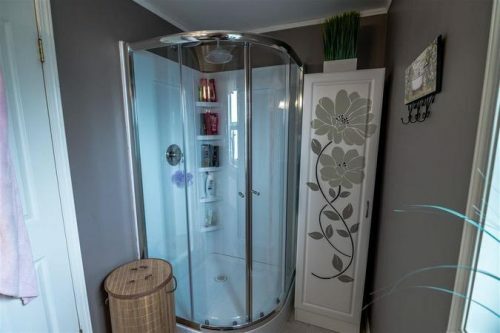 She replaced the walls, flooring, cabinets, toilet, and shower. This is what your bathroom will probably look like after the tub has been removed. No plumbing change has been made at this point. A manufactured home bathroom after the tub has been removed. Kim saved money by keeping the plumbing layout intact. She was able to use the same supply and drain lines from the original bathroom with little modification for the one-piece shower unit. 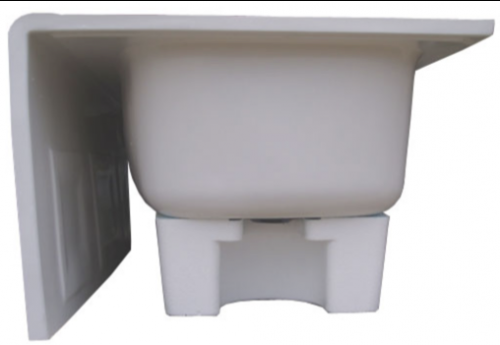 Mobile Home Repair has a great article about repairing or replacing a mobile home bathtub here. You never know what you will find once you start remodeling your manufactured home bathroom so be prepared for anything when you start tearing out wall panels and bathtubs! Most experts agree that a 10% budget cushion is the minimum you should set aside for a home remodel. Also, be sure to use LED light fixtures, low flow toilets, new faucets, and showerheads. Modern fixtures save electricity and water which saves money. Check out this great article that shows that no job is too big to tackle! Another great resource is our Mobile Home Bathroom Guide which will give you tips and tricks for that bathroom remodel. From the flooring to the bathtub it’s all in there. This article is a great tool to help you decide what you want and how to make that happen! If you are just looking for some inspiration for remodeling your manufactured home bathroom our article featuring 7 before and after bathroom remodels may help. We hope these tips help inspire and motivate you to begin the process of remodeling your manufactured home bathroom. It’s a big project but with the right knowledge and plan, you can get the bathroom of your dreams! Be sure to take pictures along the way and send them to us here at Mobile Home Living. We would love to share your experience with our readers! I’d like to replace the trim around our bathroom mirrors. Anyone have luck with this? It appears the trim is glued to the mirror. How can I safely remove the trim without breaking the mirror?? The glue they use on mobile home mirrors and the trim around the mirrors is some of the best I’ve ever encountered. I’ve never been able to remove a mirror from a wall without damage so the best I can offer is to slowly pry the trim away while keeping some heat on it (hairdryer) or pouring some goo gone behind the trim. Use a razor blade to cut the top vinyl or paper layer under the trim (or as close as possible) to avoid ripping it and then pry toward the middle of the mirror. I am a 100% Disabled Vietnam Veteran. I have mobility isues from a broken backl (L3 Shattered twice.) I i live in a double wide and have a bathroom of my own. I am unsure how much I can afford. I currently have a Garden Tub I wish to replace. I live in Pflugerville, north of Austin, TX. I Googled mobile home plumber in Austin TX and here are the results. Start calling them and see if they have any programs that can help. There are some health insurance programs that will help you put a new tub in (they have the doors on them and there are commercials for them on TV all the time). Call your insurance and see if they have anything, it’s very little out of pocket if a doctor prescribes it. Go to a mobile home supply store for showers and tubs….. 1/2 the cost of Lowes. I wish that was the case for WV (and SC isn’t too great but I only visited one store). A tub and surround were going to cost $699 for the cheapest, the better one was in the $800s at our mobile home supply company. If there is no competition in the area mobile home supplies are extremely expensive. I suspect FL and CA would have good competition so it would be cheaper to buy a mobile home sized tub and throw it in real quick. 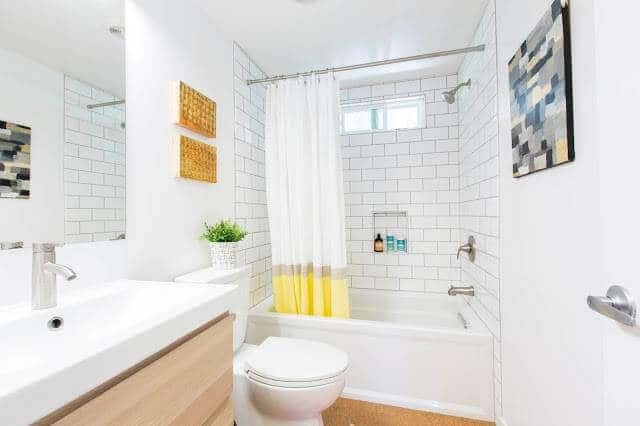 The last bathroom redo my husband did for a client was a tub for $139 at Lowe’s and a gorgeous subway tile surround for about $200. Oh, and they added a cute little gel fireplace on the wall opposite the tub. I wish I had photos, it was so pretty!